On an extinct genus of saurodont fishes. Proceedings of the Academy of Natural Sciences of Philadelphia, 24:280-281. 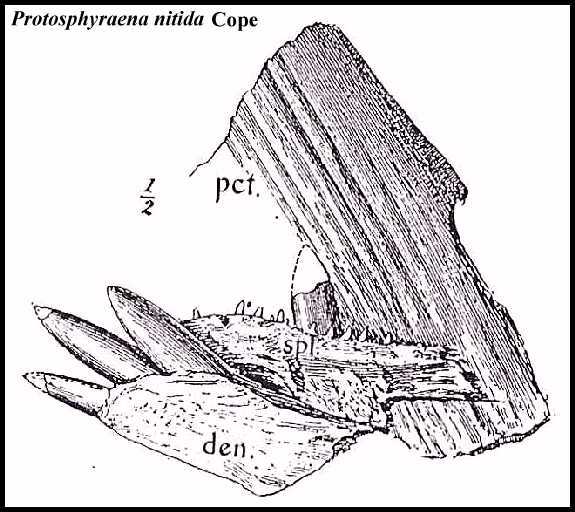 LEFT: Fragments of the lower jaw, splenial and pectoral fin of Protosphyraena nitida Cope (AMNH 2121) figured by Hay (1903). Wherein Cope names a new species (Erisichthe nitida) of fish from the Cretaceous of Kansas. In this case, however, the genus had already been named Protosphyraena (P. ferox) by Joseph Leidy in 1857, and Cope's barely pronounceable junior synonym faded into oblivion. Newton (1878, p. 788) was one of the first to comment, "Dr. Leidy in 1856 proposed, as already mentioned, the generic name of Protosphyraena, for those British specimens; and this name therefore must be adopted, and not that of Erisichthe, which was given by Prof. Cope in 1872 to the American specimens." dentary bone, and especially with Portheus in the irregular sizes of the teeth. The crowns are, however, compressed and knife-like, and closely similar to those of Saurocephalus [Harlan, 1824]. The typical species was called Erisichthe nitida, and was stated to have been discovered in the cretaceous formation of Kansas, near to the Solomon River, by Prof. B. F. Mudge. The enamel of the teeth is smooth and glistening, and their outline acuminate and rather elongate. In the anterior part of the jaw are two teeth much larger than the others, separated by a small tooth. The posterior of these is much compressed, while the anterior is oval in section, with one angular edge. Length of the restored skull between one and two feet. It was added that the Portheus angulatus, Cope, probably belongs to the genus Erisichthe, and that it differs from E. nitida in its greater size and other features. The genus was further stated to be abundant in certain formations of the Southern States, and in the English chalk. Isolated specimens of large teeth from the latter had been referred to the genus Saurocephalus in the Poissons Fossiles, which could not be distinguished from those of the genus newly described. Everhart, Michael J. 2005. Oceans of Kansas - A Natural History of the Western Interior Sea. Indiana University Press, 322 pp. Harlan, R., 1824. On a new fossil genus of the order Enalio sauri, (of Conybeare). Jour. Acad. Nat. Sci. Philadelphia, ser.1, 3(pt. 2):331-337; pl. 12, figs. 1-5. Hay, O. P., 1903. On certain genera and species of North American Cretaceous Actinopterous fishes. Bull. Amer. Mus. Nat. Hist. XIX 1-95, pls. i-v, 72 text-figs. Leidy, J.. 1857. Remarks on Saurocephalus and its allies. Trans. Amer. Philos. Soc. xi pp. 91-95, with pl. vi. Newton, E. T., 1878. Remarks on Saurocephalus, and on the species which have been referred to this genus. Quarterly Journal of the Geological Society of London. 34:786-796.